Centrally located within the major markets of the Pacific Northwest. Direct flights offered to Pasco from Seattle, Los Angeles, San Francisco, Denver, Salt Lake City, Phoenix-Mesa, Minneapolis and Las Vegas. 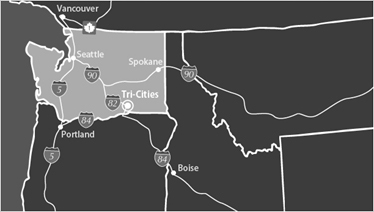 The Tri-Cities is served by Allegiant Airlines, Delta Connection, Alaska Airlines and United Express.